Many of these titles will be of special interest to young lawyers, law clerks, or anyone interested in the basics of law and legal research. What’s New in the 2017 Replacement Pages just published in June? The NEW 2017 Replacement Pages replace ALL pages in the Second Edition, expands the pattern instructions, and brings the Second Edition fully up to date with current developments in statutory and case law. The 2017 Replacement Pages include 20 revised instructions, 9 brand new instructions (covering burglary, home invasion, credit card theft and fraud, and human trafficking), as well as updated and expanded comments and notes on use. The 2017 Replacement Pages also includes an updated CD with all the instructions formatted in rich text format (fully compatible with WordPerfect® or Microsoft Word® format), saving you hours of time! Please note that Lexis and Westlaw as of today do not show that they have the updated 2017 version. Check the date to make sure you are using the most current edition online. The law library has the updated version and CD-ROM available now. The following titles have been recently shelved. Come and check them out. ADR Collection – Purchased with funds from the Maryland Judiciary’s Mediation Conflict Resolution Office. The new Maryland Civil Pattern Jury Instructions, 5th Edition, has arrived. The new edition is the first since the 2002, 4th edition, that was last updated in 2013. There are two brand new chapters on Employment Law and Maryland Constitutional Torts. All of the instructions are available in Word and Wordperfect format on the accompanying CD-ROM accessible in the law library. The instructions are also on Westlaw and Lexis. Just ask if you need help accessing the new jury instructions in any format. A new series of the American Law Report (ALR) has been released! ALR 7 will succeed ALR 6, bringing along helpful updates. Much like ALR 6, ALR 7 includes summary and analysis of cases as well as providing a jurisdictional Table of Cases and Research References with each article. One of the primary changes to take effect in ALR 7 is a new citation method. Now, ALR 7 cites section numbers (i.e. article numbers) instead of page numbers. As a result, this new method allows for the same citation to be used interchangeably between print and online sources. When using the new citation, be sure it is only in relation to ALR 7 and not previous ALR series. To verify you are using the most current version of an article, be sure to check the back of the volume for pocket parts, or use WestlawNext (available in the library). Check out these new materials, which were recently added to the Law Library’s collection. Adoption Law and Practice edited by Joan H. Hollinger et al. (KF545 .A93 1988): Published by Matthew Bender, this new addition to the Law Library’s collection is a comprehensive adoption law resource whose coverage includes information related to interstate, state-federal and international adoptions as well as current, adoption issues, such as consent/relinquishment by birth parents, adoption children with special needs, and surrogate parenting. Cloud Computing Legal Deskbook edited by Gregory Barbee (KF390.5.C6C565 2015): This resource for practitioners, published by Thomson Reuters, addresses topics ranging from the basics of cloud computers and cybersecurity to attorney-client privilege and virtual jurisdiction. 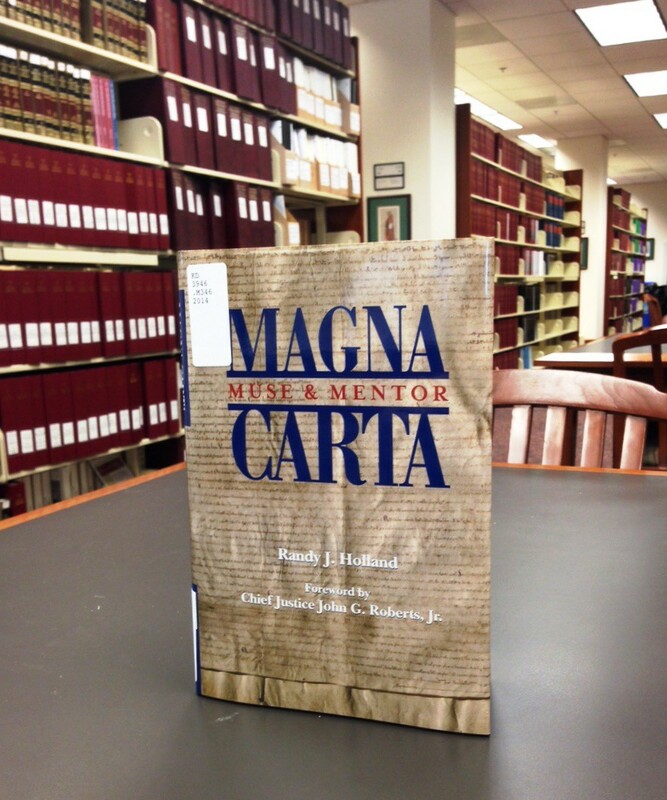 Magna Carta: Muse & Mentor edited by Randy J. Holland with a foreword by John G. Roberts, Jr., Chief Justice of the United States (KD3946 .M346 2014): 2015 marks the 800th anniversary of the Magna Carta, which was issued by King John of England in 1215. Magna Carta: Muse & Mentor, published by the Library of Congress and Thomson Reuters, is a collection of illustrated essays by legal scholars, including Justice Sandra Day O’Connor, that examine topics related to the Magna Carta, such as the Magna Carta and the United States Constitution, the Right to a Jury Trial, and Due Process of Law. MSBA Maryland Employment Law Deskbook edited by Rebecca n. Strandberg (KFM1531 .M83 2014): Published by the Maryland State Bar Association, this publication provides information and guidance for both plaintiffs and defendants involved in employment law matters. Topics include state and local fair employment practice, discrimination, the Maryland Wage Payment and Collection Law, the Maryland Wage and Hour Law, and U.S. Immigration. If you have any questions about these materials or would like additional information, please contact us! The following list was compiled for the court’s law clerks as they leave the courthouse but thought many of the titles might be of interest to attorneys just starting out or already out there practicing. Restatement of the Law Governing Lawyers. St. Paul: West, 2000. ABA/BNA Lawyers’ Manual on Professional Conduct. online Bloomberg BNA publication available in the law library. Future trends in state courts 2012 / edited by Carol R. Flango … [et al.]. Williamsburg, Va. : National Center for State Courts, c2012. Bosken, Katherine M. R. Find it free and fast on the net : Strategies for legal research on the web / [authors, Katherine M. R. Bosken . . . et al.]. Eau Claire, WI : National Business Institute , 2012. Tax exempt organizations from start to finish / [authors, Jonathan D. Ackerman, Steven M. Gevarter, Charles B. Jones]. Eau Claire, Wis. : National Business Institute, c2012. Advanced personal injury : mastering your practice / [Authors, Frank F. Daily, Rodney M. Gaston]. Eau Claire, WI : National Business Institute, c2012. United States Federal Trade Commission. Taking charge : What to do if your identity is stolen. January 2012. Washington, DC : GPO , 2012.